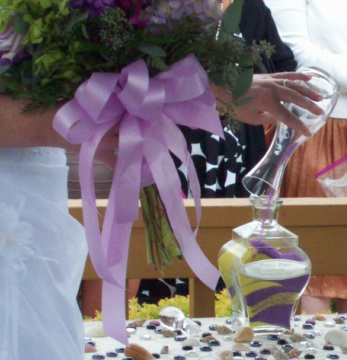 Perhaps you would like to incorporate a religious customs or tradition, such as breaking of the glass, jumping the broom, exchange of yin yang bracelets, or hand fasting. Your ceremony can be personalized to your wishes. For example a couple may want special wording about how they met, loved ones who have passed, or wording to include children they bring to the marriage. You may want to honor your mothers with a rose ceremony for them. Read through these drop down menus for examples of wording for all these ceremony elements. If you don’t see what you are looking for let me know, there are so many more beautiful add on unity elements, lets find the perfect one for your ceremony.